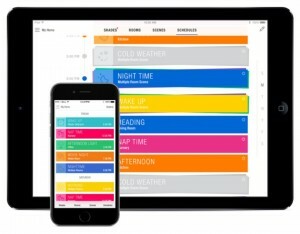 What if your window blinds could adjust themselves automatically throughout the day according to your schedule? Luxaflex remote control smart blinds can make this a reality. Simply program your app or pebble home control to reflect the positions you want for your window blinds and then schedule them using the Luxaflex PowerView app. The remote control smart blinds app allows you to control your window blinds from wherever you are in the world at the touch of a button. Set scenes to reflect different times of the day, create moods to set the ambience in your home or simply set the blinds to work around your life schedule – the choice is yours. These settings can be changed quickly and easily using the user-friendly app – it doesn’t require an expert to alter your preferences. The app features a customisable interface that allows you to make each room, blind or scene personal. Each product can be re-named quickly and easily with a series of colours and imagery to frame the page on the app, adding a personal touch to window style. The Luxaflex remote control blinds system can also be operated using two different types of Pebble controls – a pebble remote control or a pebble scene controller. These controls allow you to pre-set and operate up to six different groupings of window blinds from one remote, either individually or together with the click of a button. The scene controller features an LED screen that lets you preview and select room scenes previously programmed by the the smart blinds app. 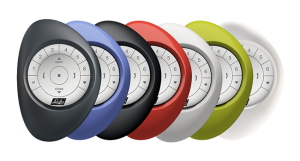 Created with design in mind, the Pebble controllers are available in 7 different colours with a wall mounted version also available in 3 colours. 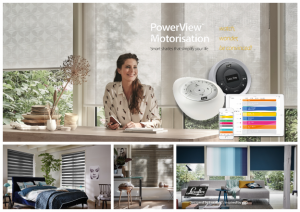 If you think that smart shades could simplify your life, why not contact us to book an appointment with one of our motorised blinds experts or visit one of our Cardiff and Bridgend showrooms today!